I’m Mainak Halder, founder of PastMasterBlogger. If you’re new to the world of blogging, building an online business and making money online, this page is for you. Before going further, let me Thank You for taking the time to visit this blog and I Warmly Welcome you to be a part of our blogging community. What PastMasterBlogger Is All About? 1. This blog is both for newbie bloggers who are about to start a blog or have just started their blog, as well as for established bloggers who have been blogging for quite some time but have not been able to reach make progress yet with their blog. 2. You’ll learn effective marketing and SEO strategies to promote your blog/business online. 3.You’ll learn how to build a successful blog in the right way. What PastMasterBlogger Is Not About? By now, you know what this blog is about but I’ll also tell you what you should not expect from this blog. This will help you set realistic expectations before you become one of our community members. 1. This blog is not about get-rich-quick schemes. Success doesn’t come overnight. So, this blog will not teach you of any get-rich-quick schemes or any MLM schemes. When I first started to make money online, it took me about a year to establish myself in the field but then I did get the success. I can call it “quick” relatively because I devoted full-time to building my online business. Many conventional internet gurus and marketers might say otherwise. The reason for preaching that you can make money online easily is that they want you to build false hopes. But I’m want you to know the truth before you get started. “Making Money Online” or “Building Your Business Online” is tough and takes a lot of effort. Don’t mistake it to be quick bucks for least time spent. Here I’ll give you all the information, without keeping anything secret but ultimately you have to do the take the action to get the results. This blog is not for those who are not interested in the blogging community or willing to start a blog. Of course, if you are at least interested to learn something with the hope of starting a blog in the future, you are warmly welcome. Ready to get started with me and join the blogging community? Before you join this community, let me tell you unlike others, you won’t find me selling anything to my list. I just use it to engage with you and form an exclusive blogging community with those interested. As a thank you gift for taking the time to read so far and join my community, you’ll get instant access to my eBook for FREE. 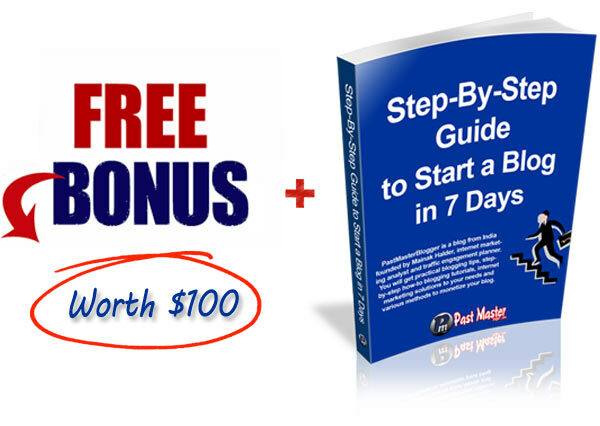 With the eBook, you’ll learn to build a WordPress blog step-by-step in just 7 days. Be the first to get hold of the latest updates from the blog. You’ll also get access to a SECRET Bonus WORTH $100!!! With all the resources in hand, you’ll be able to start a blog in no time. Just enter your name and email address in the fields below and get access to exclusive content that specially create for my mailing subscribers. Signing off, I’d like to say that I’m here with you as a guide and as a friend to hear to anything you have to say about. Thank you for your support and I look forward to meeting you on Facebook. Just say a hi and I’ll definitely respond. Did you find this page helpful enough? And my friends from around the world and especially from India, don’t you want to spread the word and make your friends aware that “Yes, Making Money Online is Possible In India?” Then, please click the below button and help make people aware!